We are delighted to announce the launch of our new combined website and online learning platform. We have listened to feedback from our instructors, candidates and online visitors and have launched a new website that combines our traditional website and online learning platform. Our new site provides a clear message about who we are, what we stand for and our values for developing, delivering and maintaining ALSG courses. The new site boasts a fresher and more dynamic look with a site-wide navigation system and improved menu functionality that directs you to the information most relevant to you. 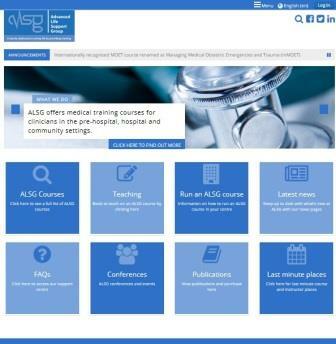 We’ve introduced a range of new content to the website, including more about ALSG and what we’re upto. With the increased use of mobile devices our site has also been optimised for smart phones and tablets, which means that all of our visitors should be able to access our content on the go.